"Hurel is one of Boston's real gems... The Pierre Hurel Trio is Boston's most sensitive working group"
Hailed by The Boston Globe's Steve Greenlee as "Boston's most sensitive working group", The Pierre Hurel Trio returns to the Regattabar where they have performed their signature sound and new original music in sold out concerts for several years. The Trio, which features Pierre Hurel on piano, John Funkhouser on bass and Mike Connors on drums, was included in The Boston Globe's short list of the 10 Best Shows of 2003 alongside Norah Jones and Dave Brubeck. Last Fall they released their 4th CD Inner Conversation. Born in Paris, pianist and composer Pierre Hurel was first discovered by Paris Jazz Conservatory's founder and director Charles Henry. At age 20, as he was about to reluctantly start a career in business, Hurel decided to change course and enrolled at the School of Modern Music in Paris. Six months later, he came to Boston for a summer session at the Berklee College of Music and has remained here ever since. Jazz journalist Virginia Schaefer wrote in AllAboutJazz.com: "Hurel's compositions and playing show the influence of European classical music, particularly of the romantic and impressionistic eras. In his playing, Hurel projects a natural grace, easygoing on the surface but precise and focused at the core." Mr. Hurel was described by the Boston Globe's David Wildman as "The extraordinary-local-but-Paris-born pianist." Reviewing one of his performances, Steve Greenlee wrote in the Boston Globe "Hurel is one of Boston's real gems. His style is impressionistic and adventurous, coming off somewhere between Bill Evans and Keith Jarrett ... 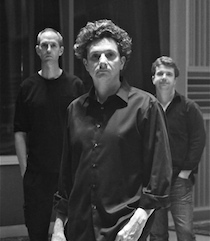 The Pierre Hurel Trio is Boston's most sensitive working group." Hurel has been featured numerous times on New England Cable News and his music has been played on WGBH, WERS, WBUR, WMBR, Paris Jazz, Europe 1 and France inter, among others. He has recorded five albums, most of which are available online at amazon.com. Hurel is a regular at the famous Cambridge Regattabar, has appeared at numerous Jazz festivals and Jazz clubs including the Duc des Lombards in Paris, the Knickerbocker in New York and locally at Sculler's and Ryles Jazz clubs, among others. He is also a faculty member at the Boston Conservatory, where he teaches a unique non-idiomatic improvisation workshop that is attracting more students every year.